As the owner of a small business, you have many of the same concerns about protecting your business as large corporations doâ€¦but likely without the resources to manage it. 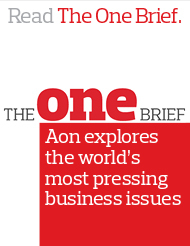 A business owner's package (BOP) from Aon Canada is the solution for you - an all-in-one policy that includes commercial property, general liability, business interruption and crime insurance at one economical price. General liability insurance: covering property damage or bodily injury done to others as a result of your business operations or products. Business interruption insurance: covering your business' fixed costs, such as rent, payroll and taxes, in the event your company has to shut down while property damage is repaired. Crime insurance: covering loss of money or securities resulting from robbery, employee theft, credit card fraud, etc. A business owner's package is a cost-effective, time-saving solution. It saves you the trouble of researching and purchasing separate policies. And it is often more economical that purchasing each type of insurance separately. An Aon professional insurance broker will help you decide the amount of insurance you need, based on your company's assets, and will help you identify the risks and determine the type of coverage needed to fully protect your company.